You'll feel like you've stepped into a Fairy Tale with this 2000 square foot cabin.Warm, inviting and beautifully decorated. Amazing attention to detail!! 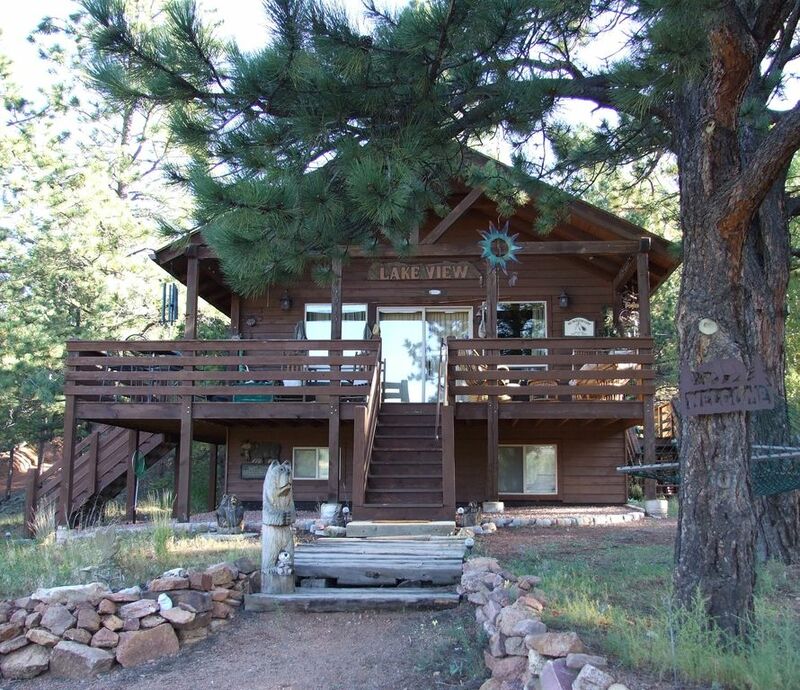 Cabin sits on a beautiful, piece of private property, away from neighbors, surrounded by pines and Pike National Forest. You couldn't ask for a more perfect get away from the hustle and bustle of everyday life. Lounge out on the huge wraparound deck with comfy futon, & two large rockers. Have your morning coffee or breakfast at the outdoor Bistro table, while taking in views of the mountains and Pine Lake. Unfortunately, NO FISHING in the Private Lake and water supply of Pine Lakes Community, but take a walk across the road to our other property and fish the many beaver ponds and Westcreek. Rainbow and Brown Trout can both be found there. You might even see the busy beavers!! Also, just down the road a few minutes at Manitou Lake there is fishing, as well as the North and South Platte rivers, just up the road a few minutes... There are 40 miles of ATV trails 5 minutes up the road for your ATV adventures...Many others close by you can trailer to....Relax with nature by day, and bask in the fiery glow of stars at night. Without city lights you feel you can almost reach out and touch them!! Grab your favorite book and relax in the large hammock that hangs between two towering pines. There's also an awesome nearby tree swing for the children or child at heart. Enjoy an evening of warmth with your family or friends around the large fire pit, roasting marshmallows or sipping a glass of wine. There also horse shoes and ladder golf- aka hillbilly golf to keep everyone entertained outdoors. Hummingbirds love Lake-view, as many as 50 have been known to be there at a time. They are very entertaining to watch. There is abundant wildlife including, Deer, Fox, Blue Heron, and Chipmunks. We have some beautiful Red Tail Hawks, Golden Eagles and our latest return of two Bald Eagles. Moose and Rocky Mountain Big Horn Sheep have been recently reintroduced to the area. A moose was spotted last year just down the road... Everyone will love the indoor hot tub and game room, with dart board, games, and puzzles. Plus a wonderful view of Thunder Butte Mountain from the large picture window. For the furry part of the family, this is a great place. Complete with two very large dog beds and the biggest 6 foot dog run ever, if you need one. Westcreek has been said to be one of the best kept secrets. We are so excited to be able to share it with others. You will likely find this to be one of the best vacations ever!! There are two full baths, one upstairs and one garden level. West creek is only 20 minutes from all the modern conveniences but away from city life..
Lake view is near Westcreek Lake - a five minute walk. Fishing is prohibited, but plenty of nearby fishing. A beautiful view of Thunder butte mountain and other nearby mountains. Telephone so far no long distance. This cabin is shaded under huge pine trees and has ceiling fans in each room. In this area it is unnecessary to have air conditioning. Electric baseboard heat in each. There is ample off street parking in front of Lake-view as well as the side garden level entrance. Living room is beautifully decorated. Leather couch (with queen hide a bed) and love seat as well an over-sized wide recliner. Full size refrigerator holds plenty of food for your adventure. Full size self cleaning oven. Limited Pantry Items, spices etc. Fully stocked with dishes, utensils, pot, pans etc. Lake-view has a full kitchen with all cooking utensils, dishes etc. There is a Roku box with Netflix, and many other options. There are an assortment of books. Game room has darts, games, a large table with two benches and hot tub. There are an assortment of board games as well as outdoor horseshoes, and ladder golf. Unfortunately with the two levels it makes it difficult for wheelchair. They would be confined to garden level entry. There is a large indoor hot tub with big picture widow with views of the great outdoors. Our family loved this place! This cabin is beautiful! Very spacious, well stocked and extremely comfortable. Brought the kids and the dog for the holidays and it was amazing. Totally recommend this for any family! Our family had a wonderful, relaxing Thanksgiving at the cabin. It was a great time to reconnect and share time together playing games, hiking, cooking, watching movies or just hanging out reading while listening to the soothing sounds of the low tone wind chimes. The kitchen is small but it has everything! Fabulous cookware, hand made pottery dishes and beverage cups, great cutlery, blender, cookie sheets and muffin tins, as well as, spices. We also brought our 2 dogs along and they had a great time exploring the wooded areas and going on hikes with the family. Awesome area to relax and get away. The cabin was perfect for all of our needs , we enjoyed the wildlife and scenery! Thanks for a great time!! Beautiful cabin and quiet area. Very peaceful. This was a lovely cabin! We all enjoyed our stay and would love to come again. The cabin was clean and well appointed. I’ve never stayed in a cabin with such nice pots and pans and dishes. It was fun to use the wonderful pottery. Wildlife viewing close to the cabin was amazing. We had a sweet fox visit several times. We stayed 5 days and 4 night in the absolutely glorious cabin. Talk about fully stalked it had everything. Even a muffin pan Had to call the manager because of a small problem with the TV and it was taken care of right away. Friendly and accommodating are just a couple of words I can think of about the manager. They had just painted the cabin to a beautiful blue color. One minor thing that might need looking into was the rug in the kitchen It was not a nonskid rug. It slid when I was walking on it. Anyone wanting to have a wonderful peaceful stay should rent this cabin. This is a beautiful cabin and all seven of us very much enjoyed our relaxing time in the mountains. We like to cook for the whole family and I think I have never encountered such great cookware in a rental place before. It was wonderful! Please call for a quote on Holiday Rates. Christmas - Thanksgiving... Our policy is to hold a credit card number as deposit. If terms of agreement are met and there is no damage, card will not be charged. Cleaning fee of $100. is for a 5 hour block. We expect reasonable care to be taken and if our cleaning time exceeds that we will pass the extra charge to the guests.